We had great participation at this year’s Maywood September 15, 2018 event. 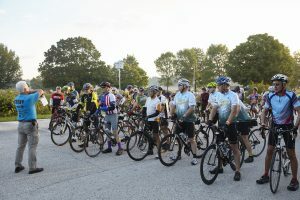 379 cyclists made it to the finish line! The amateur radio community stepped up and proved their worth in the community. 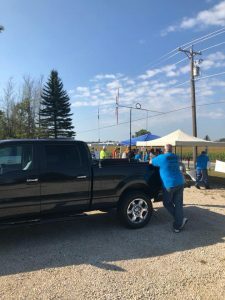 We even had some out-of-town hams pitch in to help, who brought their newly home-brewed “Mighty Woof” 2m/440 dual band antennas that were constructed at a recent Manitowoc club project meeting (photo below). Special thanks to John AB9HH and Linda K9TZU for all of their behind-the-scenes work. Many of us purchase items from Amazon. Now you can support the Sheboygan County Amateur Radio Club when you shop Amazon. Amazon Smile, is the same Amazon you know, but a donation for each purchase is made to the club. By following the link provided, your purchases will help support the club, and at no extra cost to you. So, next time you shop and purchase from Amazon, please consider using the link to help support the club financially. All licensed hams are welcome to join the nets.